So, I need to back up a bit. Back at the very beginning of this year, I decided to try wearing a knit skirt in the hope that I could combine the look of wearing a pencil skirt with the comfiness of wearing jeggings (bliss?!). I bought and tried the Colette Patterns Mabel skirt pattern (take one and take two), but there were things that I disliked about it. Despite its flaws however, I wore the second attempt quite a lot during Me-Made-May'15 so I felt that I was on the right track. Lynn from Tialys blog left a helpful comment on my Mabel skirt take two post mentioning Gertie's easy knit skirt pattern from her Gertie Sews Vintage Casual book (pictured above). As luck would have it, I received a copy of the book last Christmas but I hadn't tried any of the patterns from it. 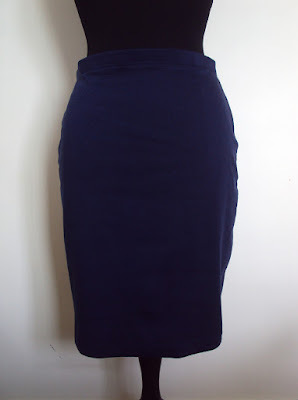 The easy knit skirt pattern (pictured below) was potentially just the ticket: pencil skirt shaped with elasticated waist. I decided it was worth a punt. 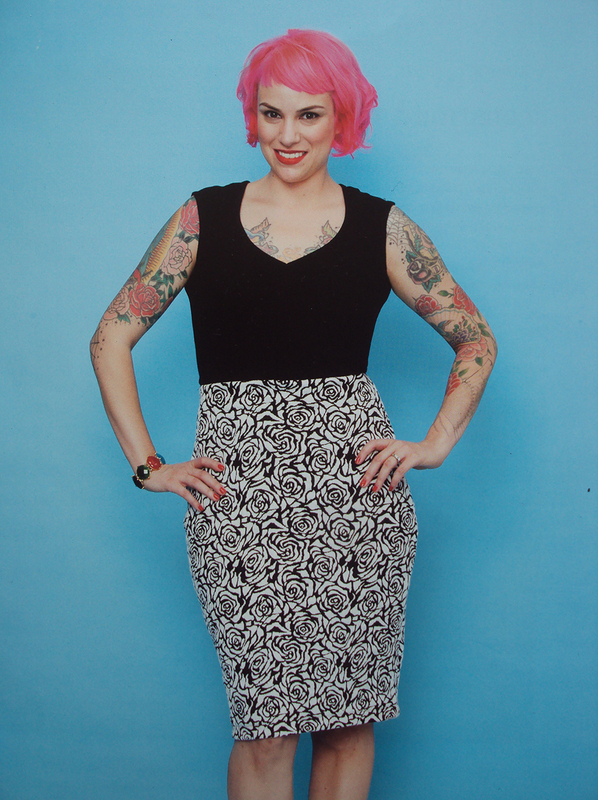 I have to mention this skirt pattern's major selling point: it consists of just one pattern piece. You cut one on the fold for the front, and one on the fold for the back. BOOM. According to the book's size chart, my measurements corresponded with one size for the hips and the next size up for the waist (although I can't remember exactly which sizes, and I am currently exiled upstairs in order to get this post done and the book is downstairs...) so I blended between the sizes which worked perfectly. The instructions in the book recommended basting the side seams together and then popping the skirt on to see how the fit is going. I basted the seams together with a long straight stitch on my regular sewing machine, then having decided that I needed to pinch out 1cm from each side seam evenly all the way down (so removing 4cm of width in total) I restitched the side seams with my overlocker. Apologies for the ugliest/most boring picture ever above! 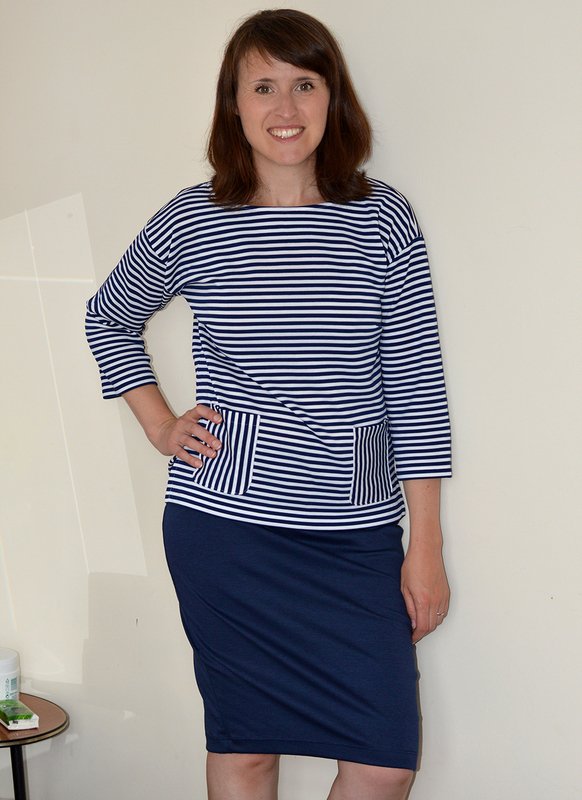 The elastic is stitched into a loop, then attached to the top raw edge of the skirt (I did this with a three-step zigzag stitch on my regular sewing machine because I didn't want to risk cutting the elastic by using my overlocker) and then simple turned under so it is out of view. Having done that I then tried the skirt on again but decided the waistline was a bit too high for my liking. Instead of unpicking, I just turned the elastic under again and topstitching it in place with my twin needle, which I also used for the hem (which I made 3cm shorter than the pattern, BTW). The finish on the outside looks great, but the extra bulk I created by turning the waistband under makes the whole waistband slightly more visible through certain tops than I would have preferred. I'm over it though. 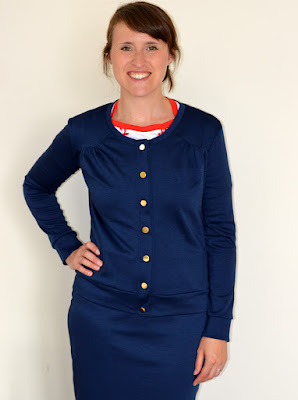 I've already talked briefly and at length about this navy Ponte de Roma, so I have little to add about it here, other than to point out that 2m gives you enough to make a Jenna cardi AND a pencil skirt. Which is pretty great, IMO. 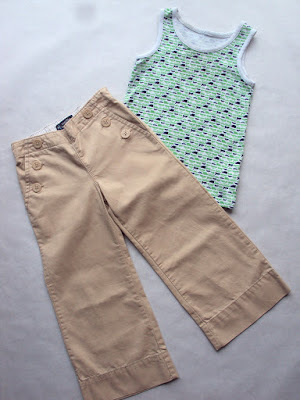 Today I'm going to give the low-down on my second version of the Jenna cardi pattern, which also happens to be second garment I made from Girl Charlee fabric that I gots to give a review of. 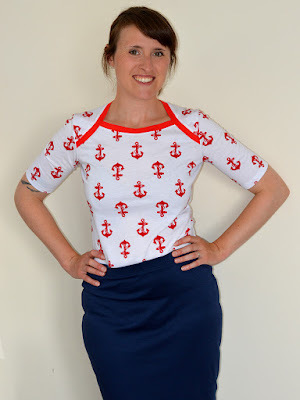 Having thought pretty hard about what would be the most useful fabric to select from the Girl Charlee website, I managed to navigate away from the fun prints and planned on making a garment that would be layer-able and in a solid colour. I sent my request for 2m of this navy Ponte de Roma and was very pleased with what showed up. 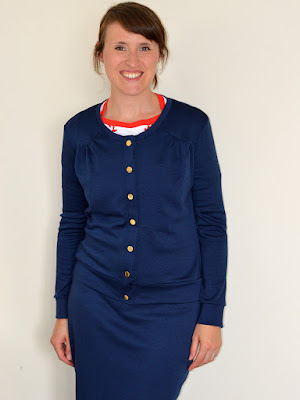 I had to use the flash on the modelled shots in this post because my bedroom is pretty gloomy, but the deeper, biro-ink navy shade in the pictures of the cardigan on my dress form is a more accurate representation. It's not the thickest Ponte de Roma I've ever encountered, which I think would make it appropriate for a wide variety of types of garment. It is, however, very soft and very stretchy with a slight sheen. I wear cardigans pretty much every day, as anyone who has seen my outfit pictures from the Me-Made-May challenges and cared to notice will already know. My long-term goal is to inch closer to a fully self-made wardrobe, so more handmade (rather than secondhand) cardigans are going to help achieve that. 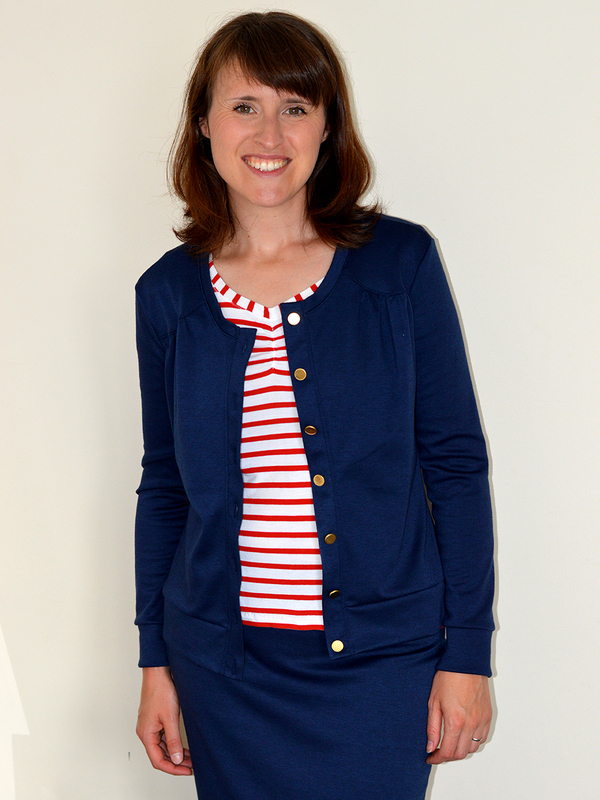 After the relative success of my leopard print Jenna cardi, I decided to visit the Jenna pattern again with this Ponte de Roma. Having another bash at the Jenna gave me the chance to try out the cute gathered-shoulder variation that I had decided might get a bit lost in a patterned fabric when I used the pattern last time. Before I could start cutting out the navy fabric however, I had to make a number of alterations to the pattern that I had noted down after my first attempt. I made all the changes that I wrote about in the leopard print version's blog post, which helped a lot to get a better fit first time. However, my mid-point fitting session showed me that even more needed to be taken out of most of the seams. I ended up removing another centimetre or so around the whole armhole/sleeve-head, and the same amount all along the sleeve and side seam. 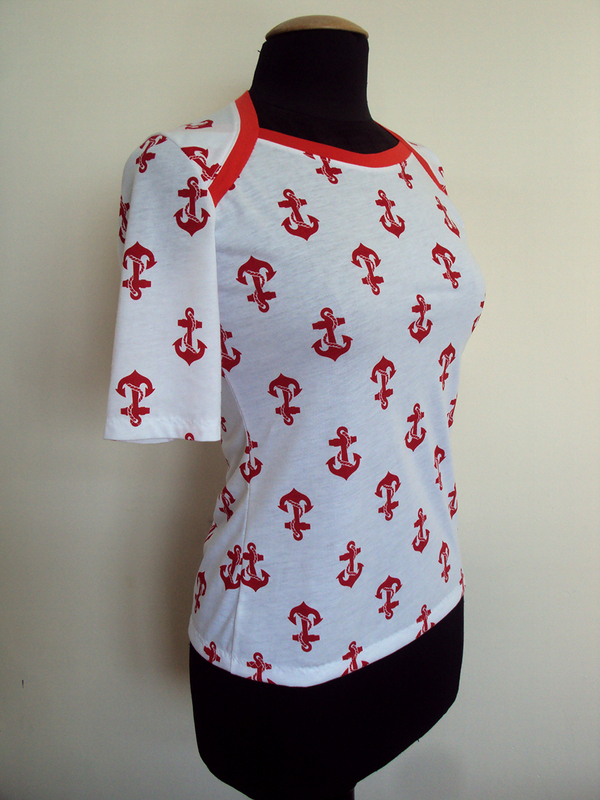 I feel I could have taken even more out of the shoulder area, but I wanted to keep it loose enough to fit over t-shirts and jersey tops. 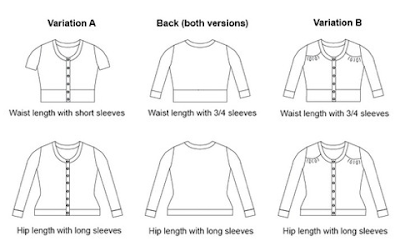 Something that I'm finally beginning to take in about sewing knit fabric, is how much the amount of stretch in the fabric effects the fit of a garment: and that a pattern that has been perfected for one knit fabric may produce a very different outcome when made in another knit. Because this Ponte de Roma is thinner and far stretchier than the leopard print double knit I previously used, I was always going to need to remove more of the Ponte de Roma fabric for comparatively successful outcomes. That said, I do think I need to remove more from the pattern around the shoulders area in whatever type of knit I use next time, probably by removing that centimetre permanently from the armholes and sleeve-heads. Funnily enough, despite this being the Girl Charlee garment that took the longest to make, it is the one I have worn the least so far (although I am wearing it as I type this, in fact). It could be because it's still quite warm so I've been reaching for finer knit cardigans instead. But I fear that the main reason I haven't worn it yet is because the navy colour doesn't work very well with my current selection of skirts and jeans, most of which are also some shade of blue. 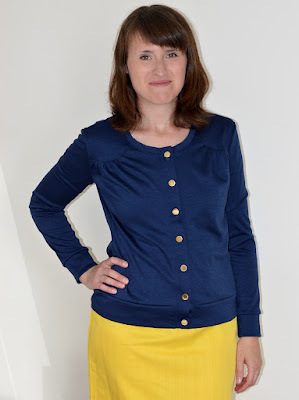 I put on my yellow skirt for some of these pictures to give more of a contrast, but I never wear that skirt in 'real life' and am actually thinking about donating it to a charity shop in my next clear out. I need to work on finding successful outfit combinations to get the most from this garment. You know me, I'm a stash buster at heart, but I can't refuse the offer of free fabric when one occurs. 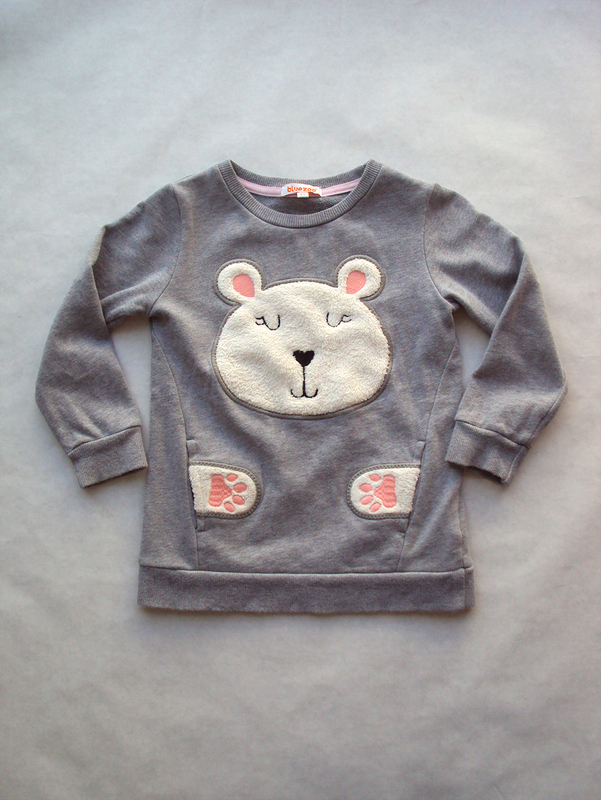 Girl Charlee has recently launched a UK and Europe arm of the long-established US company, both of which sell high quality knit fabrics. 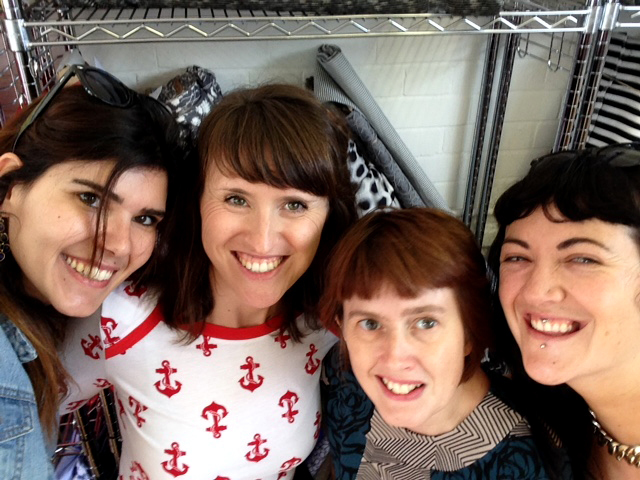 They emailed me (and probably lots more UK sewing bloggers, let's be honest!) and offered me my choice of fabric in exchange for a review on my blog, so I chanced my arm and suggested a giveaway for my readers as well. Man, the weight of what to choose hung heavy! Seeing as I don't buy new fabric as a rule, the offer of some free stuff is a chance to really fill any holes in my wardrobe. Like many sewers, my stash is full of fun prints, so I felt this was a chance to pick a quality solid coloured fabric to make some decent basics that will bring me closer to a really cohesive clothing selection. You may have read my recent ramblings on and explorations into organic cotton, so my first port of call was to see what they offered in that vein. Nothing really grabbed me from their currently-small selection, plus it was unclear if theirs are GOTS (Global Organic Textile Standard) certified (which is what you really want to find out when buying 'organic', IMO). 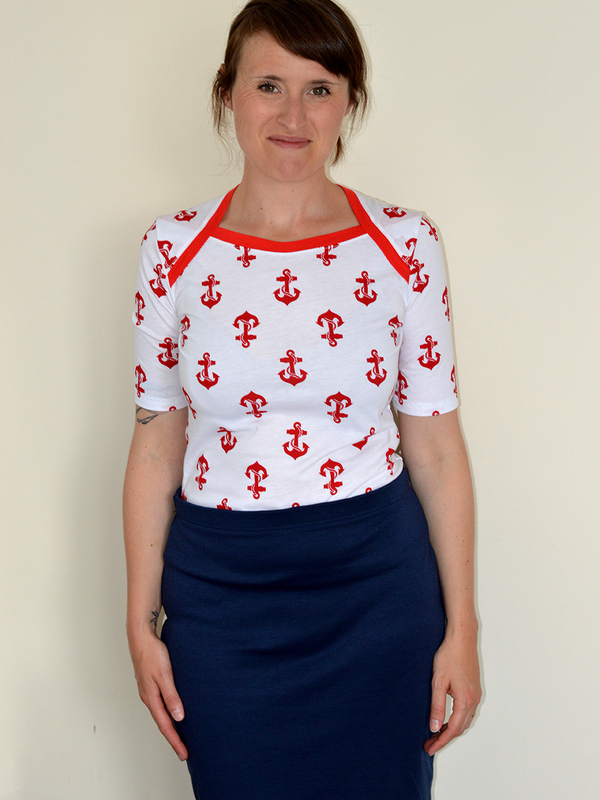 So instead I asked for 2m of this navy Ponte de Roma, and if that was out of stock then some of the red anchor print jersey instead. Never one to shy away from a stereotype, me! 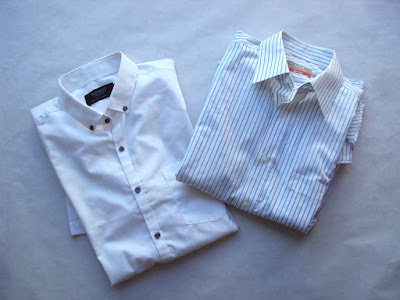 Bless them, they sent me both my selections, from which I made three different garments. I'm going to blog separately about each of these three projects but I'll run through them in brief. 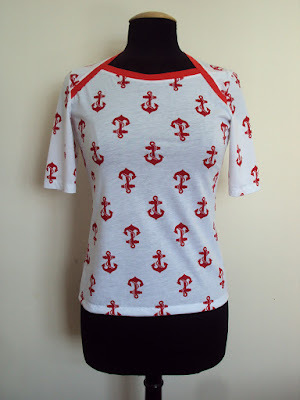 First I tackled the printed anchor jersey. The base fabric is quite fine but stable, with very little drape, and I felt a form fitting knit top pattern would be most suitable for these qualities. 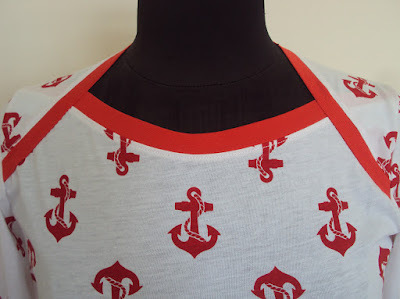 I used the Bronte top pattern by Jennifer Lauren Vintage and some scraps of red jersey from my stash for the neck bindings. 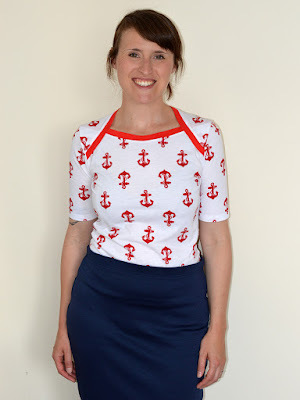 This top is so much fun! I wore it all day yesterday and it received a lot of compliments. Warning: this is an attention seeking fabric! I always had a cardigan in mind for the Ponte de Roma, as my self-made cardi selection currently consists of only my leopard print Jenna cardi. 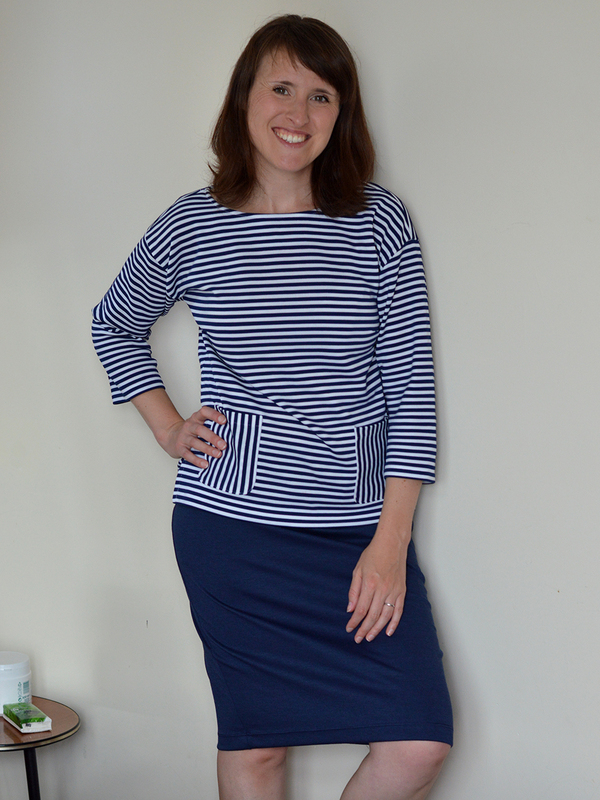 I took this opportunity to attempt the gathered shoulder version of the Jenna in a solid fabric to make a garment that will hopefully layer well with all my striped jersey tops. The Ponte de Roma is super soft so feels great against the skin. It is very stretchy so I had to adjust the pattern a bit to accommodate for that properly (more on which in the separate blog post to follow). Despite making the long sleeved and hip length options of the Jenna (i.e. the most fabric hungry), I was left with enough Ponte to whip up a knit skirt too. 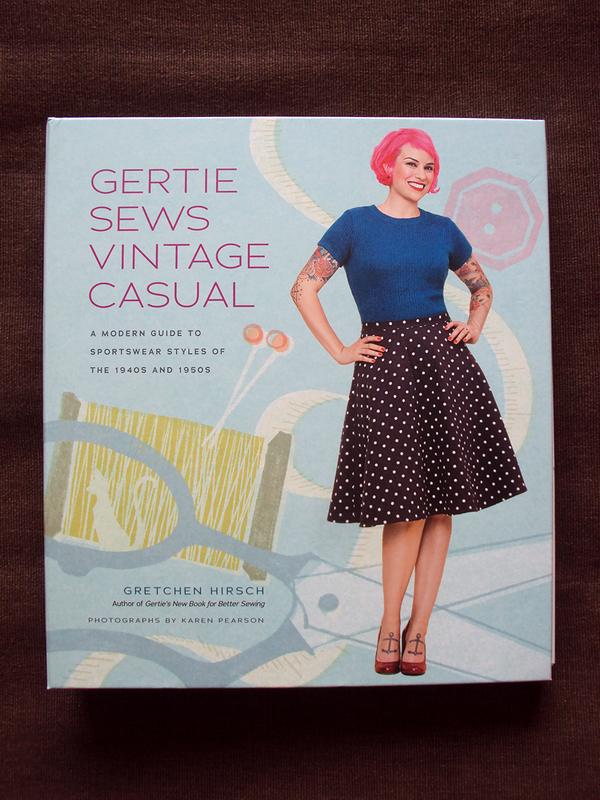 I used the knit pencil skirt pattern in the Gertie Sews Vintage Casual book, and I couldn't be happier with the final outcome. The stretchiness of the Ponte is EXACTLY what I want for making a skirt. 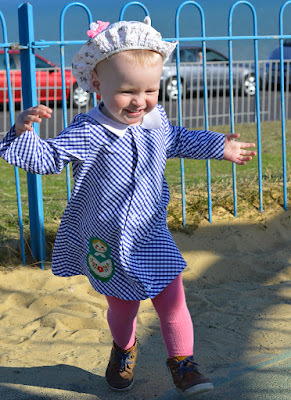 I can run around in it at playgrounds and playgroups, feel comfy on long train journeys and after eating big dinners, plus it feels lovely if worn with bare legs. 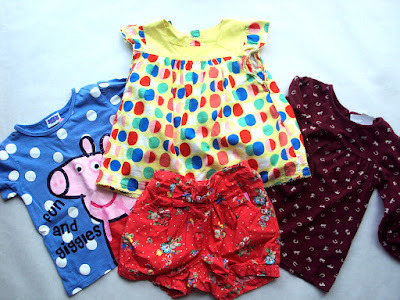 Girl Charlee are offering one of my blog readers the opportunity to be in the same situation that I was in: to choose 2m of whichever fabric that takes your fancy from their site! 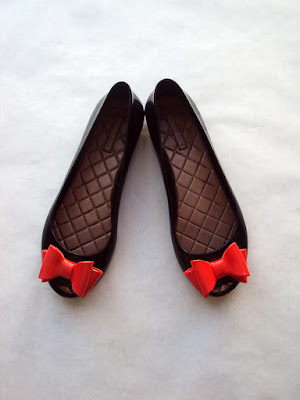 All you have to do is browse through their selection and copy the link of whichever you would like to own. Let me know what you've picked and paste that link in a comment at the bottom of this post. PLUS if you aren't sure I can find your email address within two clicks of my mouse, leave your email address in the body of the comment. Email addresses will not be used for anything other than contacting you if you win this giveaway. It's not a prerequisite for entering, but I also heartily recommend that you follow Girl Charlee on Facebook, Twitter and Instagram to hear about their special offers, new fabrics and so on. They also often share tutorials, guides, patterns, giveaways, etc. Apologies to readers of this blog who live elsewhere, but this giveaway is for residents of Europe only I'm afraid. When I can, I make my giveaways international (I ended up sending the B*Inspired magazine to New Zealand, BTW), but I'm not making the rules this time, sorry. Make sure you have commented by midnight GMT on Monday 31st August to enter. Multiple entries will be discounted, as will any entries that do not tell me which item you'd like to win (honestly, you'd be surprised by how many people will no longer be reading this far down the post...). And just to clarify, if you win your choice of fabric, it will be posted to you for free, with absolutely no cost to yourself. On the 1st September I will use a random number generator to select one winner and contact them to get their postal addresses to forward on to Girl Charlee so they can send out the prize. All clear? Good! 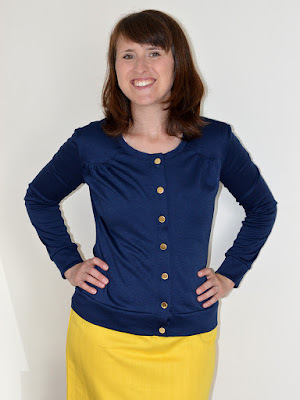 If you are even vaguely interested in refashioning, then you've probably already been flipping out over the Refashioners 2015 series on Portia's Makery blog. The big reveals of the shirt challenge results are filtering in, one per weekday, throughout August. There's been some amazing and truly inspirational projects so far, including Elisalex from By Hand London's reworking of the swiss dot Farah shirt I sent her. So, it's time to share my shirt transformation! 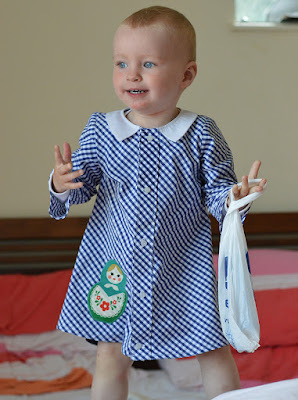 I started out with this bias-cut gingham dress shirt (picture above) which I turned into the toddler shirt dress you can see in the other pictures in this post. It was probably no surprise to you all that I made something for Dolores. I make no apologies for that as I know it's going to see a good amount of use, and I refuse to make anything these days that I don't think will be worn (by someone at least!). 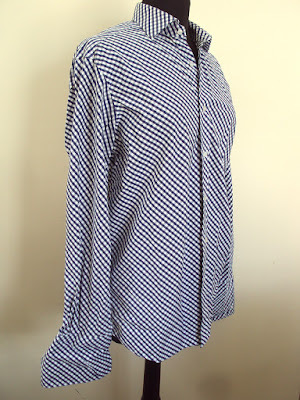 The shirt I was sent felt quite preppy to me and the fabric has quite a lot of body, so those things helped me figure out what approach to take with the project. 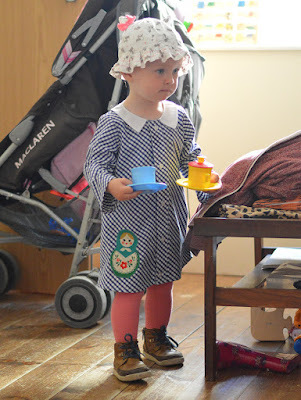 If you want to read more about how I went about this refashion, check out the full post on Portia's blog here. Don't forget: you can take part yourself by submitting a shirt refashion. You could end up winning a truly ridiculous amount of sewing-related prizes, which is now worth something like £700 (including my Dolores batwing pattern, donchaknow!). If you have even a vague idea of something you could do with an old shirt, then you may as well have a pop! 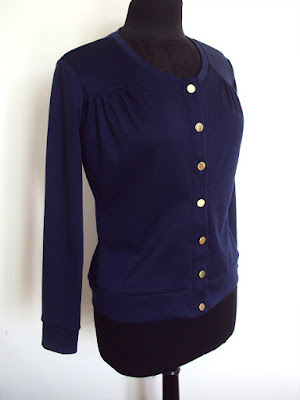 And if you don't have an idea, go on Pinterest to get some inspiration (my Refashioning Project Ideas board has some crackers). Good luck! I'm a bit slow to be blogging about this, but I wanted to share with you my version of the Fifi pyjama pattern, a recent release by Tilly and the Buttons. Along with a number of other sewers, I was asked if I would be able to test the Fifi and Bettine patterns when they were in development. Initially, I naively thought 'd have time to do both, but in reality I didn't so was asked to focus my attentions on Fifi. As you can see, Fifi comprises of a pretty vest top and shorts, both to be made in a fine woven fabric. The vest top features pleated cups at the bust, a bias finish around the top edge that forms the straps, and a delicately curved hem. I'm not sure what to say about the shorts, other than they are small! The version of the pattern I made was obviously the beta version, but it came out pretty damn nice. There were, of course, a couple of tweaks I felt needed to be made (that's the point of having testers, after all), and I have yet to try the final version of the pattern, so I shall comment on it no further. 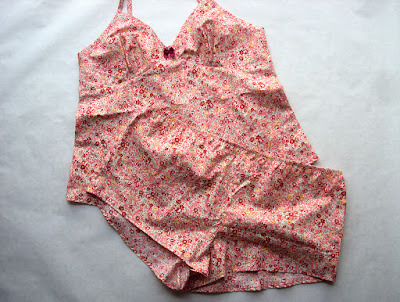 My Fifi jammies were made from some pink ditsy floral print faux-Liberty lawn. 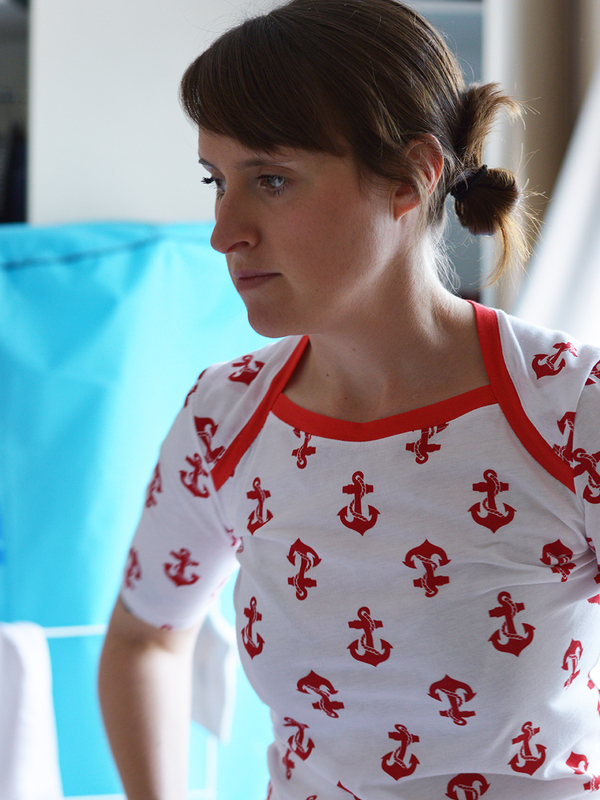 I tried on the set to assess the fit, and the fabric managed to make me look both pasty AND blotchy! The fabric was the only thing suitable in my stash, and seeing as I feel the cold a lot anyway, I've decided to give this set to a friend who lives somewhere much hotter than I do. I've already seen some really lovely Fifis popping up on blogs (like Jenna's amazing shirt refashioned version) and Instagram. I'm quite new to the IG game, and can be found at @sozoblog over there, BTW. 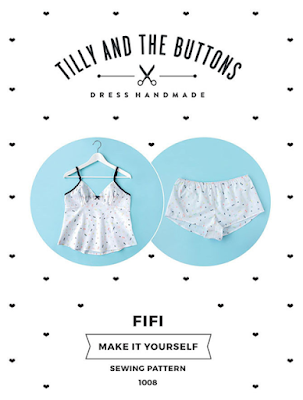 If I ever book myself a holiday to somewhere super toasty, I'll be sure to whip up another set of Fifi's. 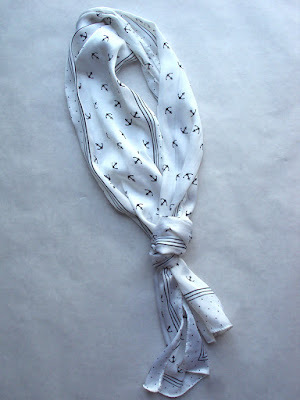 Hmm, I wonder what they look like in nautical colours, perhaps with a little anchor button where the bow is positioned! My goodness. Since May I have been charity shopping HARD and have accrued quite the backlog to share with you. 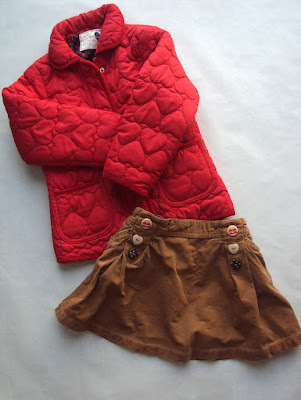 As you can see from the title of this post, nowhere is safe from my thrifting antics. You know how this works, let's get down to business. Darlington came up trumps with a slice of summery separates for Dolores. This haul also proves the legend that things in the North are MUCH cheaper! I bought this beautiful swiss dot men's shirt to send to Elisalex of By Hand London for the forthcoming Refashioners challenge. This is actually the second shirt I bought for the task, but the first one I sent went missing in the post. The turn of events worked out well because this shirt is far nicer than the first (which did eventually turn up much later). Can't wait to see what she turns it into! 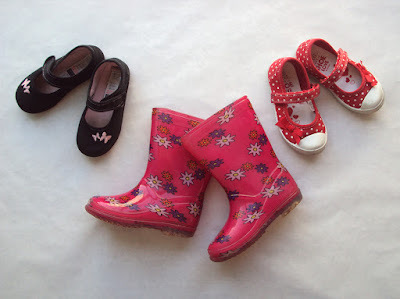 I'm always hoovering up cute never-or-barely-worn children's shoes when I see them. It feels good to have a stash of nice footwear put aside for Dolores, and it takes the pressure off having to suddenly splash out £30 every few months. You rarely find children's shoes in good condition from size 8+ though, I guess because kids' feet growth slows down from then onwards and their shoes subsequently get more of a licking. Therefore, I'm enjoying being able to pick up some pairs for a song until I need to start shelling out the £30's each time. 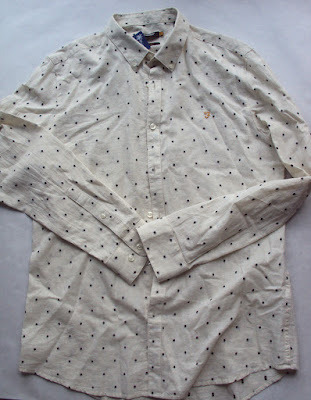 I stalked the Oxfam window a few days running after I spotted this. Each time I went to try and buy it, the shop was closed. Finally, I got there when it was open, but the scarf was no longer visible! 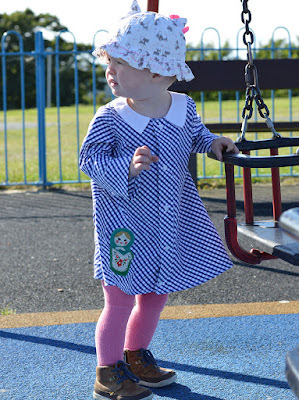 Thankfully, it had been put back inside and I've been wearing this round my noggin ever since, channelling Brigitte Bardot at the playgroups! 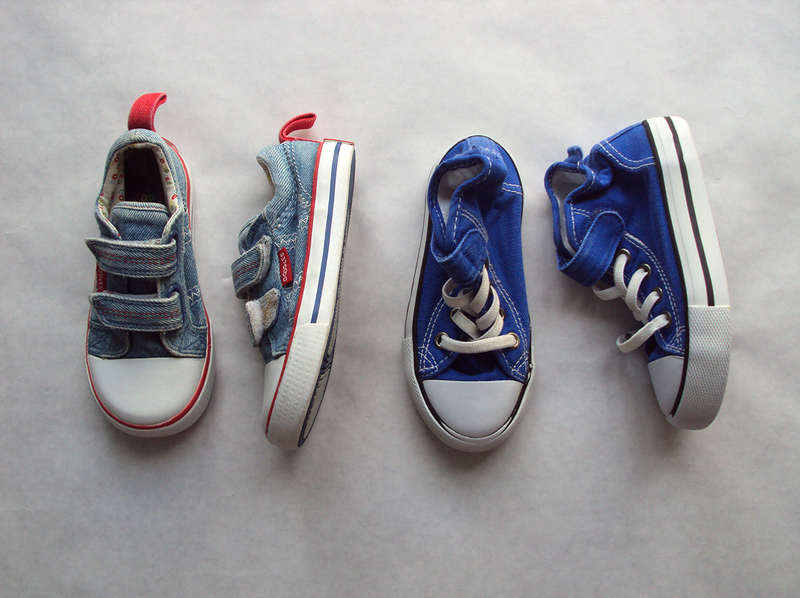 More future-footwear in a variety of sizes. Pat finally got a look-in after a plaintive cry went out for more work shirts! Something else for me! Not convinced on the comfort level of these, but the application of plasters may aid these in getting trotted out. Anyway, how cute?! I am not including any of the toys or books that I buy secondhand in these round ups. If I did, I wouldn't have time to blog about anything else! Having just sorted through all Dolores's future-clothes, I am now placing a temporary ban on myself on buying more. 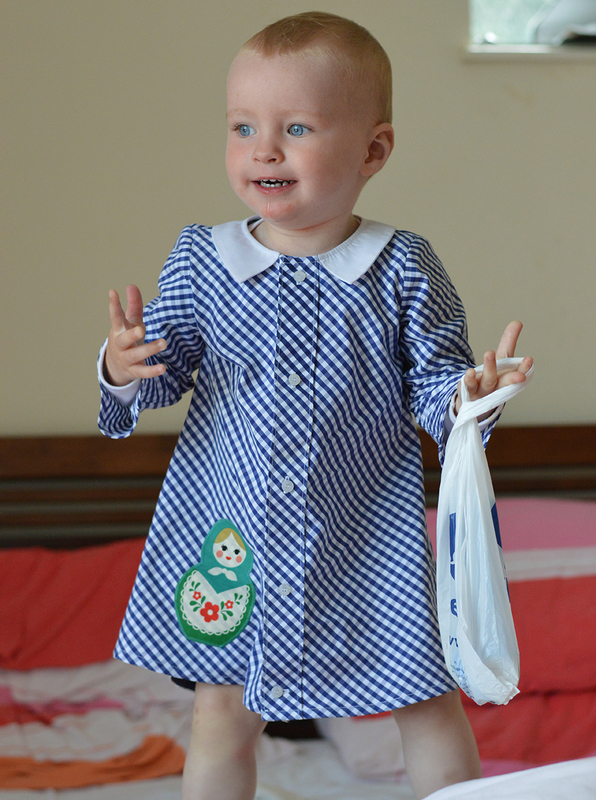 At this rate, she won't have any wardrobe gaps that will require me to sew her things. 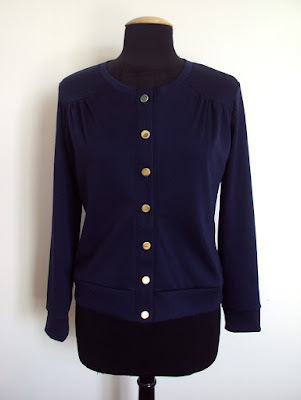 Have you had any good charity shop/thrift store/op-shop scores lately?